So I’ve not written a review in ages! Today I’m showing you a fish themed stamping plate from BornPrettyStore. Have a little look at the following pictures and let’s play ‘One of these things is not like the others’. Anyway, the fish images are pretty usable and picked up crisply. They lend themselves well to reverse stamping if that’s your bag but if it’s not don’t worry as they can also be used just as effectively for as stamp-and-go images. However, if you have quite long nails I think you’d struggle to cover them with just one image. I think you’d have to pick up the image twice and try to do some sort of over-lap. I have naturally long nails without have long growth (if that makes sense) and the images were close to being too small to cover mine. Also, as beautiful as the central goldfish is I didn’t have much practical use for it as it’s massive! So which was your favourite? If you fancy trying out some fish-related designs the plate is currently on sale for only $1.59 and free shipping! Should you happen to add anything else to your basket, use my code AZYW10 at the checkout to receive 10% off all your full priced items. So this is the final polish that I purchased from Primark. It’s called ‘interstellar’ and behaved much like the others; smooth application, very good coverage, not overly smelly. I wore this design to work and unfortunately it chipped really badly. Now if you take in to consideration that I’m in a swimming pool for 2 and a half hours, there can sometimes be some lifting or peeling, but I was a little bit disappointed by just how much came off. Never the less, the polish only cost £1.50 so…. P.S why the fish? Well I’m off fishing tomorrow – fingers crossed for a successful catch! So admittedly I had to google ‘japanese fish flag’ to find out what the proper name for these cute little wind socks were. Turns out, they’re not just decorative and actually help to celebrate ‘Childrens Day’ in Japan. Koinobori are displayed from April to early May, (appropriate timing for this nail design then) and each fish represents a different family member; the black and biggest is the father, the red is the mother and then the smaller fish traditionally starting with blue, then green, represent the children! Why carp? Well apparently carp symoblise strength and courage due to their ability to swim up streams and it is hoped that by flying these carp the children will grow up to be strong and healthy too. How interesting is that (Big thanks to wikipedia)! It’s not my neatest stamping work, I was under a bit of time pressure so had to hash them out which was a shame as they deserved better. But they still look kinda cute! The largest koinobori image is from the Nee Jolie ‘Japan style’ plate that I’ve been addicted to lately, (sushi and blossom anyone?) whilst the smaller carp are from a Harunouta L002 plate which I’ve reviewed previously. So these little fish charms were purchased in August, but now I can say I’ve used them – twice actually! I wasn’t happy with the way the first design turned out, it was just a bit ‘blah’. My spray marble didn’t turn out very nice, and there wasn’t much thought to it. The second design however packed a little more punch I felt, and I much prefer the black and gold combo. So just in case you’ve missed me saying it before, I’ll say it again – I love fish! At the weekend my dad and I took a trip up to Dundee to visit two fantastic fish shops; Discovery Aquatics and House of Pisces. My main aim was to find a lovely new fancy goldfish, I was super excited and I had high hopes as HOP always have a great selection. I even painted my nails, and added little black oranda water transfers for extra luck and joy! I really only have myself to blame for getting too excited, and stupid superstitions say that I almost jinxed the whole thing by putting orandas on my nails. Never mind, the hunt continues! So Born Pretty Store sent me some ‘Fish Scale Stencils‘* to review this week. There are 9 stencils in a packet which is a little strange if you intend to use one for each finger though, presuming you have 10 nails to paint of course. They come on a clear backing which you need to peel them off of and sort of as one sheet. I’d advise being careful when trying to detach them from each other as the stencil vinyl is pretty thin and feels a little delicate. As you can see I managed to tear off the corner, so maybe cutting them would have been better. The first thing to do is to apply a base colour, I chose a metallic silver, and it’s important you let this dry completely. If you were to place the stencil on any sooner you run the risk of peeling the polish off with it. After sponging/painting on your top polish, carefully peel off the stencil and hopefully you’ll like what you see! The stencils weren’t as durable as others that I’ve reviewed from BPS, however I still got two nails done from one which isn’t bad going. I didn’t want to push it any further as they were starting to feel too flimsy. I finished the look off with a top coat and added some typically related decorations – pearls, micro-beads and a shell. (Yawn.) But doesn’t it look pretty! I know this might seem strange, but the actual stencil part was looking really beautiful after being sponged with my top colour so I trimmed it to fit my nail and stuck it down. I had to apply two coats of seche vite to get it thick enough to achieve a smooth looking finish. Doesn’t it look cool? The next polish I tried the stencils with was a thermal one – because they’re just so much fun. It’s a lot easier to see the pattern definition with this colour combination too. As you can see there was very little leakage, nothing major enough that it couldn’t be corrected, meaning the stencils did their job – well done stencils! Below are some Coldfish Scales. Bahahaha goldfish, coldfish? Because the thermal polish is cold. So funny! If you would like to try out these Fish Scale Stencils, they are available from BornPrettyStore and are currently (19/10) selling for $1.39 – pretty cheap huh! Don’t be concerned that it’s in dollars, paypal converts your total for you in to your preferred currency, or be worried about the potential cost of shipping – it’s free! 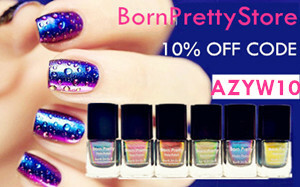 If you use my code ‘AZYW10’ you will also get 10% off all full priced items. So I’m actually a big fan of Magikarp. Not because he evolves in to super powerful Gyarados, but just because he’s a fish Pokemon! And he’s sorta cute too yeah? So I wasn’t in the mood for painting anything free-hand today so I cracked out my stamping folder and chose a pond themed plate by hehe. I have a few ‘ponds’ in my garden, just little container ones with plants only but they still attract plenty of wildlife! Last year I actually had a Dragonfly visit, I have no idea where it came from originally because there’s not any large bodies of water nearby. To create this look I first of all stamped a water movement image in lighter blue on to my base colour, and it is pretty subtle so don’t worry if you didn’t spot it. I then tried to turn the fish into calico koi by splodging together orange, white and black polishes before scraping the excess off the image. The design was still looking a little plain so I then painted some water lilly pads and viola! I used loose glitter to create the blue/silver ombre: I regretted that decision after only the first nail as there was immediately glitter everywhere. For the images I used the reverse stamping technique with my clear, squishy stamper. So I think I’ve found my new favourite polish – thermal colour changing polish! It’s magical, I don’t think I’ve ever played about so much in the sink whilst washing my hands before. The polish is from BornPrettyStore, in shade 110, and if I’m being honest I really wasn’t expecting much. When I saw it in the bottle, the colour looked a bit icky, the formula seemed a bit weird and I didn’t have high hopes for how easy it would be to change it’s colour. I WAS SO WRONG! Before I went any further by adding any stamping, I decided to test it. BOOM! Mind blown. It just has to touch the hot water and it immediately changes, the lavender turns to a beautiful blue. I was not expecting it to work so well, I thought I’d maybe have to be scalding myself with boiling water before I even got a hint of the other shade. I went with fish for the stamped image, as I liked the playfulness of the blue being the ‘hidden’ colour. At first I thought it was only going to change when I washed my hands in the hot water, but over the past day I’ve found that it does change on it’s own accord due to my body temperature! And that makes it way more awesome. For example, I noticed when I was cross-stitching some of my fingers were turning to blue, whilst at work (on poolside) I was flashing blue, when I’m typing (like right now) all my fingers are blue, and this morning in bed (as I painted these last night) I was bright blue too! I loved this polish so much I’ve ordered another colour, and I even took a video of it! (Shame it’s such grainy quality, cringe.) Right now the polish is half price (16.06.2016) and it’s free shipping so I’m not sure why you wouldn’t give it a go! Watch the video and let me know if you’re going to try it.